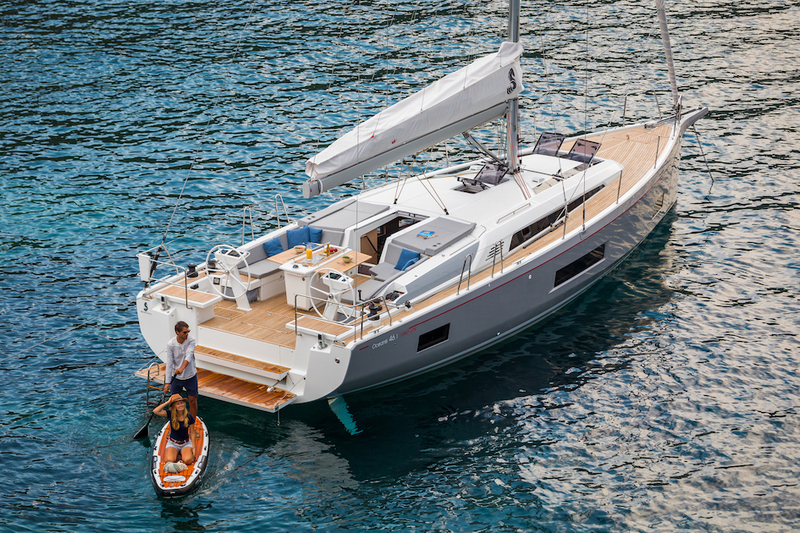 Beneteau’s new Oceanis 46.1 epitomises the best of modern production yacht design, where the emphasis is firmly on ‘user friendly’, but with enhanced performance. The French boating giant is flexing its muscles strongly with an array of enticing new models, a revitalisation of its famous performance First range, and the reinvention of its best-selling Oceanis cruisers, including the 46.1, the 51.1 and for 2019, the 30.1. One casualty in all this is the ending of the luxury Sense range ­­– which had a relatively short life of eight years. This is good news for Oceanis fans, who will experience a raft of new models and a flagship range-topping Oceanis Yacht brand. Joint Beneteau General Manager Gianguido Girotti outlined the Group’s plans during a chat at the global launch of the Oceanis 46.1 in Sydney. 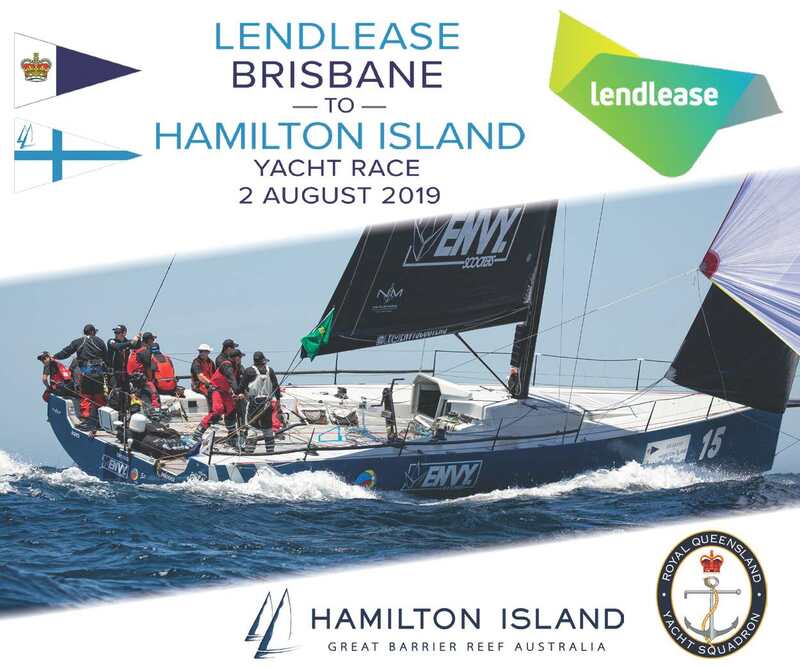 “The 46.1 and 51.1 are fast-cruisers with performance options and deep lead keels so these Seventh Generation Oceanis offer more than the previous editions,” he said. A walk-through of these models revealed slick design complemented by clever accessories, such as retractable davits, while also claiming the largest owner’s forecabin in the market, plus better stability because of lead options instead of cast iron in the keels. 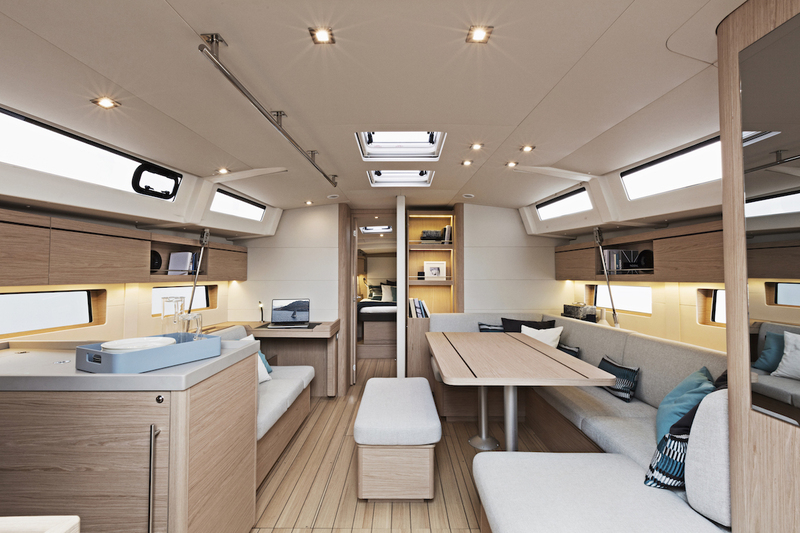 However, cruising boats are predominantly about comfortable sailing, so Beneteau continues a strong emphasis on this, with items like the electric swing-out transom barbecue and large cockpit table with cool box. Naval architect Pascal Conq has been a regular Oceanis collaborator of late. The 46.1 reflects the evolution of his thinking, which initially moved the sail plan further aft to balance the boat better and now comes with a higher level of options to create a performance-cruiser. Externally, the aesthetics are extremely appealing thanks to the large hull volume. It allows for a flush deck with only the semi-raised saloon to interrupt the flow of the topsides. This sleek profile makes a bold statement about the 46.1’s abilities. Blue water cruising sailors seeking protection in the cockpit may not agree, but there is a slot for an optional sprayhood which would be essential for offshore passage-making. 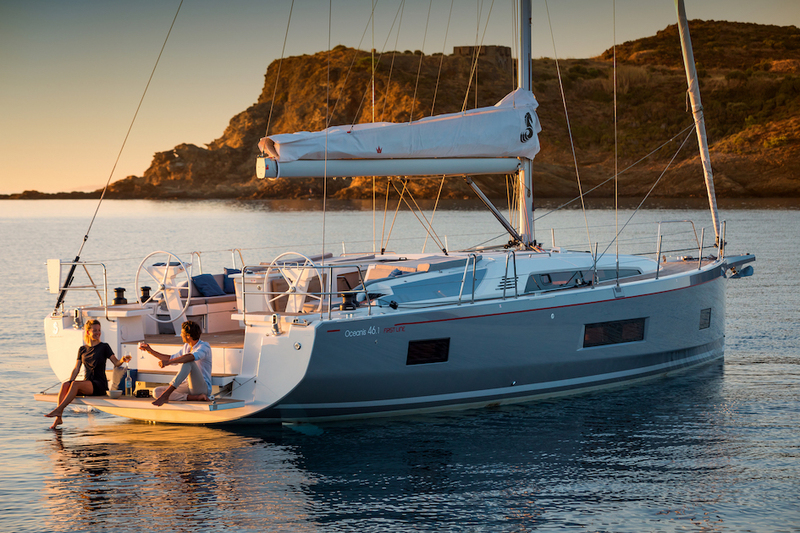 Also available is Beneteau’s fibreglass arch which controls the boom; as well as creating a sturdy sprayhood – with the trade-off of the mainsail being higher. Looking around the cockpit, the most striking feature is lots of flat teak-clad surfaces – in the cockpit and saloon top – while all sail controls are separated aft beside the twin binnacles. Sail controls are reasonably simple, with two pairs of Harken Performa electric winches on the coaming beside each binnacle. These are the primaries and control the German mainsheet, along with jammers for all halyards on each side; so ideal for short-handed. The large teak table with grabrails is handy for bracing, as are the handles on the binnacles and a welcome feature are the voluminous rope bins on each. Another race feature at the binnacles are the lifting footrests, something I found useful as the angle of heel increased with our review boat’s performance sail plan, while space between the binnacles easily allows crew passing between to the electric fold-down transom swim platform. Other good features at the binnacles include a prominent compass on each, while the B&G electronics are easily readable thanks to a seven-inch Zeus plotter on each side. The engine controls are located to starboard. Halyard control on our review boat was done with an electric H40.2ST with rotating off-switch to prevent inadvertent use, while a larger H46.2ST sheets the genoa. Underfoot, the optional teak cladding hides a central main hatch giving access to the shafts for the twin rudders in case emergency steering is required, while on each quarter are deep lazarettes. Walking forward, the GRP decks give good grip underfoot while outboard shrouds clear the way to the wide foredeck, an ideal sunbathing area at anchor. The anchor setup uses a smallish Quick vertical windlass, with single bow roller running through the GRP beak (an integrated bowsprit). Other good features on the deck include midship cleats and an integrated GRP toerail. The review boat’s optional bowsprit ensures the Code 0 is well clear of the forestay, so a worthwhile option. Entering the saloon, the first major plus is traditional washboards on the main hatch; Beneteau at last ditching the saloon door-style entrance for a more seaworthy approach. Down here there can be up to five cabins and four bathrooms, so the Oceanis 46.1 should have wide appeal including to charter companies. Alternatively, the cruising couple might opt for the three-cabin version and use one aft berth as a handy storage locker. In all layouts the owner’s berth is forward, where a second bathroom can be included. Our review boat, hull number two, came with three cabins and two bathrooms (with owner’s ensuite forward). Interestingly, the Nauta Design interior has reverted to fairly traditional. Call me old fashioned but I generally prefer a more sea-going layout that offers plenty of support rather than an open plan arrangement so again the 46.1 gets a tick of approval for the U-shaped dinette with table, separate compression post for hand support, and longitudinal grab rails overhead. The galley on the aft port side and bathroom opposite does mean that the navigation station is relegated to the forward bulkhead, which requires the skipper to swivel around and stand up to check the cockpit. Traditionalists might say it’s too far from the companionway, but it provides a bulkhead for instruments and is beside a large rectangular portlight. This location, instead of a sliding midships one as on older models, means that the dinette is freed up for crew to enjoy both sides of the table when the central bench is moved out. Another welcome return is traditional overhead lockers throughout, including in the galley. 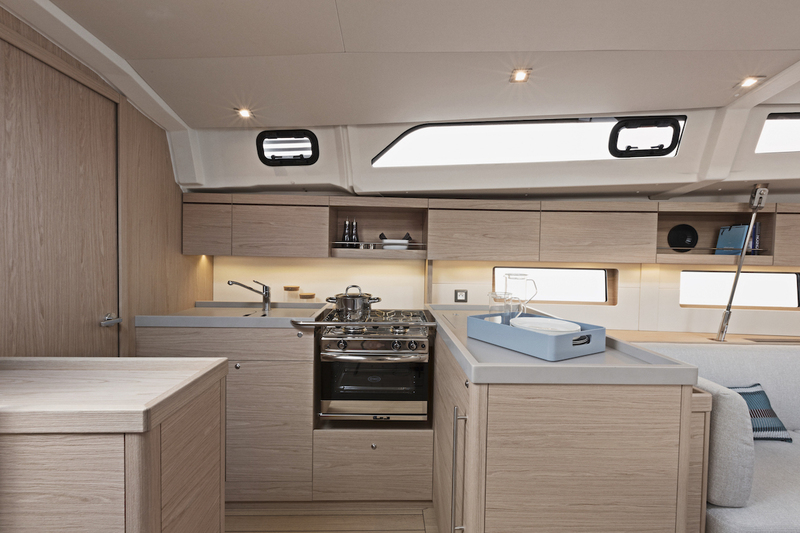 The U-shaped galley has Corian worktops, sensibly deep fiddles and ample cupboard space. Other good points are the energy-saving chest fridge, dual sinks and gimballed gas oven/cooktop. Overhead, an optional Whirlpool microwave sits in one cupboard (powered by shore power or generator) and an optional workbench-cupboard was also fitted to enhance the storage. In terms of quality, the standard of fixtures and fittings throughout was very high and the precision CNC machining ensured that all joinery neatly fitted together. The review boat was finished in darkish Alpi mahogany, but a lighter version is also available. The review boat’s three-cabin layout had the fairly standard two doubles aft. Each of these has ample opening hatches, a tall cupboard and useful side access to the engine house. Up forward the owner’s berth enjoys relative seclusion with its ensuite bathroom. Here, the benefit of the scow bow shape Pascal Conq has created comes in the form of massive volume and that industry-leading room size. This not only allows for a large island bed but gives space around its base for bench seating each side (as well as storage beneath despite the bow thruster installation) which creates a very liveable space. This is further enhanced when I check the ablutions to find that the head and shower are two separate rooms on each side of the hull. In both, a moulded floor is easily cleaned and the head is electric plus there’s hatch ventilation. Other good features include twin skylights and portlights that improve the airiness and there’s space on the aft bulkhead for a television. Ducts for the optional air conditioning are another good comfort feature (and there’s space behind the engine for the optional 7.5 KVA generator). The engine is revealed upon lifting up the companionway steps where the four-cylinder Yanmar 47hp sail drive (with 80hp option) sits fairly high above the bilges. Front access to the main service points – impeller, oilways and filters – is good, and the starting battery is nearby in the port cabin, along with two house batteries and the main switches. The saildrive gearbox on our review boat came with a three-bladed folding propeller, something essential for competitive twilight racing, rather than the standard fixed model. Displacement is about the same as older models (10,597kg for the 46.1 and 10,565kg for Oceanis 46 in 2006), however, the shape has been broadened aft and given a fuller bow for better off-the-wind performance. Hull rigidity comes from a moulded grid and the hard chines, along with internal stringers. The twin rudders are required to control the hull’s wide beam that runs right back to the transom, and the rudder shafts are stainless. A major option with this seventh generation of Oceanis is the lead-bulbed-keel option which enhances stiffness and allows a greater sail area to be carried upwind. In terms of sails, the area of the mainsail and the genoa are the same to balance the 46.1 overall sail plan. This also has the advantage for cruising sailors in offering a more balanced helm and thus less amps consumed on your autopilot. The self-tacking track for a jib is another good cruising feature on the 46.1, allowing a cutter style rig which is ideal for short-handed sailing. Reefing on the mainsail was done with a single line and the sail was easily controlled by the optional lazy jacks with the low boom height particularly welcome. The Z-Spars rig on our review boat had the one metre longer performance alloy mast with racing North 3DI sails bent on. Some other notable features were the wire standing rigging that had large chain plates going through the deck into the hull grid and the backstay was hydraulic. Yacht handling can be fraught, so the owner of our review boat ordered dealer Flagstaff Marine to have a drop-down bow thruster fitted, which we used to ease ourselves out of the tight marina berth, before accelerating smoothly to a cruising speed of 7.4 knots with the Yanmar 47hp engine at 2,200rpm as we reached open water. A windy day with gusts is an ideal way to test a performance-cruiser as the boat requires constant adjustment, so my time at the helm of the Oceanis 46.1 was thrilling. With the genoa fully unwound and the carbon mainsail quickly hoisted by the electric Harken winch, our review boat was fully loaded as the 20 knot gusts blew off the nearby Pittwater hills. From comfortable seating on the teak coaming, only a light touch on the composite wheel was required to control the 46.1 and even in the gusts the weather helm proved just about right as we slowly rounded up then bore away in the lulls. The deep lead-bulbed keel drove us close to windward (about 25 degrees) while boat speed was an impressive eight knots in the 13-knot breeze, rising to 9.8 as the gusts hit. Razor sharp tacking followed as the flat-panelled North Sails genoa snapped across and was skirted quickly by my crewmate. Walking easily between the helms and sitting out far enough to see the tell-tales stream horizontal confirmed the good overall ergonomics of the 46.1’s steering setup. Off the wind, another pleasant surprise awaited, because the wide hull maintained its speed when running at 170 degrees. This boded well for when a Code O could be hoisted off the bowsprit, allowing the stepped hull to lift in the water and accelerate downwind. Cruising sailors will also benefit from this efficient hull, which made me conclude that this Oceanis 46.1 is indeed a pleasurable performer.